Neck pain is one of the most prevalent musculoskeletal pathologies. There is, however, no evidence of the effectiveness of neuromuscular taping versus physiotherapy, or of their combined therapy. To analyze: the effects of taping compared with those of a physiotherapy program; and the additional benefits that could be obtained if these two therapies were combined in the management of neck pain. A total of 60 patients diagnosed with cervical pain were selected and a quasi-experimental pre-post parallel, four-arm simple blind design was utilized: physiotherapy alone; taping alone; physiotherapy plus taping; and taping plus physiotherapy. The effects were estimated, using fixed effects models, for pain at rest, on palpation and in movement. The greatest intra-individual change was found with physiotherapy (β=−1.81; CI95%: −2.69 to −0.93), followed by the physiotherapy plus taping (β=−1.57; CI95%: −2.32 to −0.83), then taping plus physiotherapy (β=−1.29; CI95%: −1.98 to −0.60). Taping alone, however, achieved only a marginally significant reduction (β=−0.50; CI95%: −1.11 to 0.10). Regarding palpation pain, a statistically significant reduction was only observed for physiotherapy (β=−0.84; CI95%: −1.56 to −0.11) and physiotherapy plus taping (β=−0.52; CI95%: −1.09 to 0.04). Finally, for movement pain, a statistically significant reduction for physiotherapy was observed (β=−1.28; CI95%: −2.02 to −0.55) and very similar reductions were observed for physiotherapy plus taping and taping plus physiotherapy. According to the results of the present study, physiotherapy would be the most effective treatment for cervical pain. El dolor de cuello es una de las patologías musculoesqueléticas más prevalentes. Sin embargo, no hay evidencia de la efectividad del vendaje neuromuscular frente a la fisioterapia o de su terapia combinada. Analizar: los efectos del vendaje comparados con los de un programa de fisioterapia; y los beneficios adicionales que podrían obtenerse si estas dos terapias se combinaran en el tratamiento del dolor de cuello. Se seleccionaron un total de 60 pacientes diagnosticados con dolor cervical y se utilizó un diseño ciego simple cuasi- experimental, pre-post-paralelo, de cuatro brazos: fisioterapia exclusiva; vendaje exclusivo; Fisioterapia más vendaje, fisioterapia más vendaje. Los efectos se estimaron, utilizando modelos de efectos fijos, para el dolor en reposo, a la palpación y en movimiento. El mayor cambio intra-individual se encontró con fisioterapia (β = -1.81; IC95%: -2.69 a -0.93), seguido de fisioterapia más vendaje (β = -1.57; IC95%: -2.32 a -0.83) y luego vendaje más fisioterapia (β = -1.29; IC95%: -1.98 a -0.60). Sin embargo, el vendaje exclusivo logró una reducción marginalmente significativa (β = -0.50; IC95%: -1.11 a 0.10). Con respecto al dolor de palpación, solo se observó una reducción estadísticamente significativa para fisioterapia (β = -0.84; IC95%: -1.56 a -0.11) y fisioterapia más vendaje (β = -0.52; IC95%: -1.09 a 0.04). Finalmente, en relación al dolor de movimiento, se observó una reducción estadísticamente significativa para fisioterapia (β = -1.28; IC95%: -2.02 a -0.55) y se observaron reducciones muy similares para fisioterapia más vendaje y vendaje más fisioterapia. Según los resultados del presente estudio, la fisioterapia sería el tratamiento más efectivo para el dolor cervical. Cervical pain is a common health problem throughout the world, occurring in people of all ages from childhood to elder years1. Its prevalence increases with age, reaching a maximum peak between the ages of 54 and 64, and it is estimated that up to 70% of adults have suffered from this at some point in their lives, with particular incidence in certain types of labor2. Neuromuscular taping has been applied in acute lesions of the cervical spine to reduce pain and improve the range of motion3 and its effects have been compared to manual manipulation techniques that have yielded similar results4. In other studies, it has been evaluated as a complementary method to other therapeutic methods5,6. Neuromuscular taping is a method of taping that aims to stimulate the self-healing mechanisms of the body without restricting movement, while also creating stimuli not only for the external elements of the body but also the internal ones. The most significant outcome of this method is the achievement of greater painless mobility of the musculoskeletal system, avoiding restrictions in movement7. It’s draining, anti- inflammatory, circulatory, and analgesic capabilities have been attributed to the reduction of the interstitial pressure that it produces, enabling it to raise the subcutis skin, thereby favoring the drainage and decompression of the said area8,9. However, this novel therapeutic tool requires further studies to support the evidence in favor of its benefits and allow for the setting of guidelines for a better utilization of this therapeutic method in the management of cervical pain. The efficacy of the physiotherapeutic treatment and its different modalities have been proven to reduce musculoskeletal pain10,11. Therefore, the principal objective of this study is to analyze the effects of taping in the reduction of cervical pain versus the effects of physiotherapy, as well as the additional benefits that could be obtained if these two therapies were combined for the management of neck pain and whether the results of the complementary treatment are modified according to the order in which the neuromuscular taping treatment is applied. Hypotheses of the present study is that neuromuscular taping on its own may have similar effects to physiotherapy in terms of the reduction of pain and improvement of joint mobility and muscular strength, although better results may be obtained if physiotherapy is complemented with neuromuscular taping compared to when they are applied independently; likewise, when complementary treatment involves neuromuscular taping prior to physiotherapy, this may offer greater benefits than if applied inversely. Design of the study: This research adopts a quasi-experimental design12: pre-post parallel; simple blind (of the evaluator); and four-armed, with 15 patients in each group (n=60). Group 1 received 11 consecutive sessions of physiotherapy alone, group 2 received 11 consecutive days of treatment with neuromuscular taping alone, group 3 received six consecutive sessions of physiotherapy followed by five days with neuromuscular taping, and, finally, group 4 started with five days of neuromuscular taping followed by six consecutive sessions of physiotherapy. The combined intervention included physiotherapy treatment and neuromuscular taping: the physiotherapy-plus-taping group received six consecutive sessions of physiotherapy, followed by the application of neuromuscular taping for five consecutive days; and the taping-plus-physiotherapy group started with five days of neuromuscular taping followed by six consecutive sessions of physiotherapy. 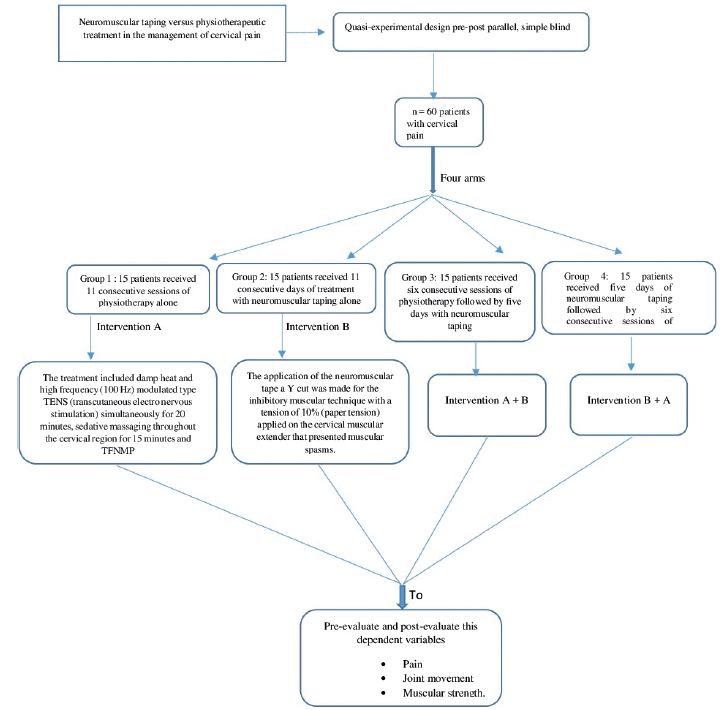 A flow chart of the groups’ treatments is shown in Figure 1. Figure 1 Flowchart of the study design. Sample and recruitment: The sample was made up of 60 patients (using out-patient services) with cervical pain. The criteria for inclusion were: persons of both genders between the ages of 20 and 60 (the pain may present itself differently in different age groups); and with a medical diagnosis of cervical pain. Patients that presented a base pathology for cervical pain, anatomical alterations, or surgical treatments on the cervical spine, as well as pregnant women, were excluded. Definition of the interventions (independent variables): The physiotherapy treatment included damp heat and high frequency (100 Hz) modulated type TENS (Transcutaneous Electro Nervous Stimulation) simultaneously for 20 minutes, sedative massaging throughout the cervical region for 15 minutes, and TFNMP (Proprioceptive Neuromuscular Facilitative Techniques) specifically rhythmic stabilization on the cervical spine13. For the application of the neuromuscular tape, a Y-cut was made for the inhibitory muscular technique with a tension of 10% (paper tension) applied on the cervical muscular extender that presented muscular spasms, based at the first thoracic vertebra and anchored at either side of the upper end of the neck (Figure 2). Figure 2 Application of neuromuscular taping with muscular inhibitory technique Y cut (blue taping), and space technique with I cut (black taping). Collection instruments: Evaluations of pain using the Visual Analogue Scale (VAS) were registered14. The range of motion of the cervical spine was actively evaluated in the movements of flexion, extension, right and left inclination, and right and left rotation, which were measured with a manual goniometer. The muscular strength of the cervical spine was evaluated by manual muscle testing using the 0−5 Oxford scale, with 0 representing the absence of contraction and 5 representing movement in the full range of joint movement against gravity and normal resistance15. A questionnaire was done to evaluate: occupational risk factors such as exposure to vibration, uncomfortable postures, load handling, and repetitive movements; socio-economic status; level of education; smoking habits; alcohol consumption; and the use of drugs. The pretest and posttest of the study groups were conducted by an expert evaluator: a physical therapist who specializes in pedagogy, with 14 years of experience in assistance, teaching, administrative, and research areas, who was outside of the team of researchers and had no knowledge of the interventions. Operationalization of variables: The dependent variables were: pain; joint movement; and muscular strength. For pain, quantitative counting variables were used, in which there were three indicators for resting, palpation, and movement pain, using the VAS, ranging from 0 to 100 millimeters, where 0 is the absence of pain and 100 the worse pain imaginable: measurements was made in millimeters for more accurate scores14. Regarding joint movement, this was operationalized as continuous quantitative variables evaluated through the measurement of the ranges of active joint movement with indicators for flexion, extension, right and left inclination, and right and left rotation of the cervical spine, measured in degrees16. Finally, the muscular-strength quantitative variable was measured using indicators for flexor, extensor, right- and left-incliner, and left- and right-rotator muscles, measured in a range from 1 to 5 points depending on the excursion of the range of motion, the effect of gravity, and the resistance offered by the muscle, according to the Oxford scale15. Statistical analysis: The qualitative variables are described with absolute and relative frequencies (%), both for the whole of the sample and within each intervention group. The quantitative variables were summarized with medians and interquartile ranges (IR), both marginally and within each arm. The differences between the basal qualitative variables per intervention group were evaluated using Fisher’s exact test. For the continuous variables at the basal level, cross tabulations were made, and the differences were evaluated using the Kruskal−Wallis test. The pre-post changes for each of the dependent variables are presented with the delta of the median, and their statistical significance was evaluated with the Wilcoxon test for related samples. Finally, for each of the pain variables, a Poisson regression model of fixed effects was adjusted for the intra-individual delta. Fixed-effects models are regression models that allow the estimation of intra-individual change and can use any binding function; in this case, the Log link function and a Poisson distribution were used, given that the response was a score (a discrete variable). These models are unbiased for the individual variables fixed in time, and hence give better estimators than the models of random effects17. All of the associations were considered statistically significant to an alpha value of 0.10. All of the analyses were performed with STATA 12 (Stata Corporation, College Station, TX). This research had the endorsement of the institutional ethics committee; all of the participating subjects signed the informed consent form18,19. The final sample of the study comprised 60 subjects affiliated to the E.S.E. Guane Clinic in Floridablanca, of which 75% were women, with an average age of 47 (IR: 38.5–51.5). Of the participants, 30% (n=18) were from stratum 1, 40% (n=24) from stratum 2, 13.33% (n=8) from stratum 3, and 15% (n=9) from stratum 4 -No data was obtained from one participant-. Regarding the level of education, 43.33% (n=26) had received complete or incomplete levels of secondary education, 40% (n=24) had completed elementary school, 11.67% (n=7) had technical or technological levels of education, and 5% (n=3) had received higher education. In terms of time dedicated to work, 47.67% (n=28) worked full time outside of the home, 35% (n=21) worked full time from home, 10% (n=6) worked part time outside of the home, 3.33% (n=2) worked part time from home, and 3.39% (n=2) were unemployed (again, an individual did not have data) . The types of occupations performed by the participants were as follows: 41.67% (n=25) managed the family home; 23.33% (n=14) ran independent businesses, 16.67% (n=10) were dressmakers, hairdressers, or worked in the building trade; 8.33% (n=5) were administrative or office workers; 6.67% (n=4) were unemployed or students; and 3.33% (n=2) worked in the law or systems-engineering professions. Regarding pain medication taken by the participants, 61.67% (n=37) were taking medication: 40% (n=24) were taking non-steroid anti-inflammatory medications (NSAIDs); 25% (n=15) were taking analgesics; and 16.67% (n=10) were taking muscle relaxants. Table 1 presents the socio-demographic and clinical basal characteristics of the participants in each intervention group in order to evaluate the comparability of the subjects. There were no statistically significant differences in the distribution of gender, socio-economic stratum, age, or level of education (p>10). Table 1 Basal socio-demographic and clinical characteristics of participants - Bucaramanga, 2016. *Absolute (n) and relative frequencies (%). For continuous variables, medians and interquartile ranges are presented. There were also no significant statistical differences in the consumption of medicines nor in any of the behavioral factors. There was, however, a difference, though not significant, in the evolution of the affliction, being lower in the group intervened with physiotherapy alone and in the group that received physiotherapy plus taping. Significant differences were also found in the distribution of the occupational risk factors of vibration and uncomfortable posture. Regarding the clinical variables, no significant statistical differences were observed in pain prior to the intervention nor to rest, palpation, or movement (p>10). 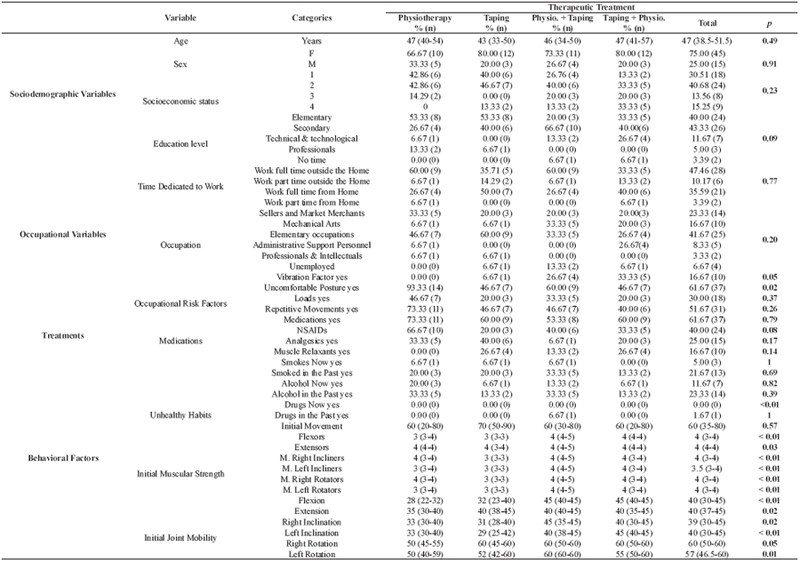 It must be emphasized that, although they were not statistically significant, differences between groups were noted in the distribution of the level of education: in the taping-plus-physiotherapy and physiotherapy-plus-taping groups, there were no participants with higher education; these same groups were also the most exposed to vibration (occupational risk factors); and the physiotherapy group presented a greater exposure to uncomfortable postures than the others. As for clinical variables, resting pain was initially lower in the physiotherapy group than in the others. In Table 2, the pre-post changes are presented with their statistical significance. Notably, all four groups showed a significant reduction in painful symptomatology; however, the group intervened with physiotherapy alone had a complete resolution of pain surpassing the results obtained with the other interventions; in comparing the combined interventions with each other; similar results were obtained. Regarding joint mobility, the groups with highest increase in the range of motion were those intervened with physiotherapy alone and taping alone, each showing a similar increase; the increase in the range of flexion in the neck was better in the physiotherapy group alone and the increase in the range of left rotation was better for the taping group. In terms of muscular strength, though initially the groups showed no significant affliction, this increased in a similar manner in all four intervention groups. The estimator for each dimension by intervention group is presented Table 2. ΔChange in the median Post. vs. Pre. P= Values of p for the Wilcoxon Test for related samples. Table 3 shows the results of the fixed-effects model. Three models were adjusted for the three response variables: resting pain; palpation pain; and movement pain. For each model, the Beta coefficient is presented with its respective confidence interval at 95%, which must be interpreted as the average before−after intra-individual change for each treatment in the logarithm of the score of each pain scale. Table 3 Model of fixed effects for the intra-individual change in the resting, palpation and movement pain according to the treatment group. β = Adjusted average change. For resting pain, the greatest intra-individual change was found for physiotherapy alone (β=−1.81; CI95%: −2.69 to −0.93), followed by the physiotherapy-plus-taping combination (β=−1.57; CI95%: −2.32 to −0.83), the taping-plus-physiotherapy combination (β=−1.29; CI95%: −1.98 to −0.60). Taping alone achieved a marginally significant reduction (β=−0.50; CI95%: −1.11 to 0.10). Regarding palpation pain, a statistically significant reduction was observed only for physiotherapy (β=−0.84; CI95%: −1.56 to −0.11) and the physiotherapy-plus-taping combination (β=−0.52; CI95%: −1.09 to 0.04). Finally, in relation to movement pain, a statistically significant reduction for physiotherapy was observed (β=−1.28; CI95%: −2.02 to −0.55); very similar reductions were also observed for the physiotherapy-plus- taping and taping-plus-physiotherapy combinations. A statistically significant reduction of movement pain was also observed for taping, although less significant than for the other interventions. It must be noted that the sample comprised more women than men and that the greatest proportion was from the lower socio-economic stratum; this aspect is also linked to the low level of education of the majority of the participants, which supports the evidence of studies that link this to pain of the cervical spine20. The limited education of the participant has perhaps led to most of them to working in low-skilled occupations, e.g. cleaning, food preparation, and cargo transportation21. Therefore, they are exposed to occupational risk factors such as unnatural postures, repetitive movements, and load handling, and prior research has demonstrated the relationship between these risk factors and the occurrence of painful musculoskeletal syndromes22,23,24. Regarding whether the participants took medications for cervical pain, it was found that the majority did, and of these most were taking NSAIDs; however, their painful symptomatology persisted. Examining the effects of taping in the response variables, we found that pain, in its different manifestations, presented a significant reduction in the different study groups; the group intervened with physiotherapy alone, however, obtained the best results, surpassing those obtained with the other interventions. The group intervened with physiotherapy plus taping did obtain a complete resolution of their painful symptomatology, but only in the resting-pain indicator. One of the hypotheses of this study was that better results may be obtained in the reduction of pain, gaining of strength, and range of motion when physiotherapy was complemented with neuromuscular taping; however, none of the combined interventions had better results than those obtained in the group that received physiotherapy alone. The combined-intervention groups, however, demonstrated better results than those obtained in the group that received neuromuscular taping alone in terms of reduction of pain. The hypothesis that neuromuscular taping alone may have similar effects to those of physiotherapy in terms of the reduction of pain is, therefore, rejected. In comparing the combined interventions with each other, similar results were obtained, which may indicate that the order in which physiotherapy and taping are applied in the combined interventions has no influence on their results. The hypothesis that, in a complementary treatment, starting with the application of neuromuscular taping and continuing with that of physiotherapy may offer greater benefits was also rejected. In terms of the joint-mobility variable, all of the groups improved; however, the groups with a greater degree of affliction (those intervened with physiotherapy alone and taping alone), showed a greater increase in these ranges. The increase in the range of flexion of the neck was better with physiotherapy alone, and that of the left rotation for the taping group; however, the results obtained with only physiotherapy were the greatest. The muscular strength of the four study groups increased in a similar manner. The results of the pre-post analyses may be seen as confusing, so the best estimations of the potential change in the response variables must be inferred from the regression model, especially as it refers to a model of fixed effects, in which, given its specification, it has been completely controlled at least by the fixed variables in time in modeling the intra-individual change. According to this model, for resting pain, the greatest reduction was achieved with physiotherapy, and no differences were found in the results with the physiotherapy-plus-taping or the taping-plus-physiotherapy combinations. In the case with taping alone, this reduction was marginally significant. It is important to consider that this study is original in the physiotherapeutic intervention with a complete physiotherapeutic program25,26 compared to taping alone; in other studies, neuromuscular taping was applied only as a complementary intervention to physiotherapy or to isolated modes of physiotherapy, as e.g. exercise27,28,29. The majority of participants intervened with physiotherapy alone and physiotherapy plus taping had spent less time suffering from the pathology than those of the other two groups, making this a confounding factor. For palpation pain, a significant reduction was found in the physiotherapy group while, for the other three interventions, a very slight increase of this manifestation was observed; although this increase was not statistically significant, the reason for it might be found in the fact that all of the study groups, except for the one that was intervened with physiotherapy alone, were exposed to the vibration factor in their occupations and the exposure to this risk factor is associated with the occurrence of cervical pain and other painful musculoskeletal syndromes. The extent to which these groups had been exposed to vibration in their occupations during the period of their intervention might perhaps explain this finding29,30. For movement pain, a reduction was observed in all of the interventions, although it was greater when physiotherapy was administered exclusively. The low size of the sample and the non-randomized assignment of the intervention are found to be the prime limitations of the study. Nevertheless, the adjusted statistical model allows for partially controlling a possible effect of the confusion, at least by the fixed variables in time. The standardization of the procedures of intervention, as well as the measuring of the outcomes are found to be the strengths of this study, for which the evaluators were also blind to the intervention status of each subject, which minimized the influence of the differential and non-differential information bias. Finally, there were no follow-up losses in any group, which avoided further affecting the statistical power or any bias due to differential losses. In the end both the physiotherapy and neuromuscular taping treatments showed improvements in the reduction of pain, an increase in the ranges of motion and muscular strength of the cervical spine. The results obtained with physiotherapy alone, however, surpassed those obtained with neuromuscular taping and those obtained with a combined therapy. According to the results of the present study, physiotherapy would be the most effective treatment for cervical pain. It is recommended that studies be conducted with a greater sample size with randomized assignment. Periodic follow-ups, for a longer period of time, would also be of value as this would the trajectories of the outcomes to be obtained during and after the intervention. This investigation was sponsored by the Research Department of the Universidad Manuela Beltrán. Correspondence: Ximena María Villota Chicaíza. Address: Cl. 33 27-12, Bucaramanga, Santander. Phone number: (+57) 652 5202 Ext. 7168-7400. E-mail: sing663@hotmail.com.com. This work is under License Creative Commons Attribution 4.0 International.